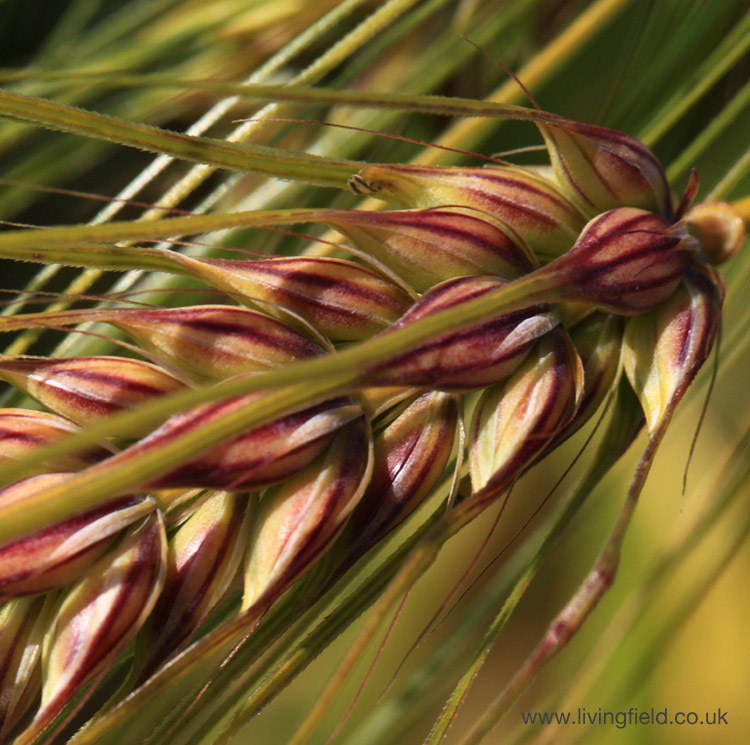 The Living Field project has been sharing knowledge of ancient and modern cereal grains for over 10 years . 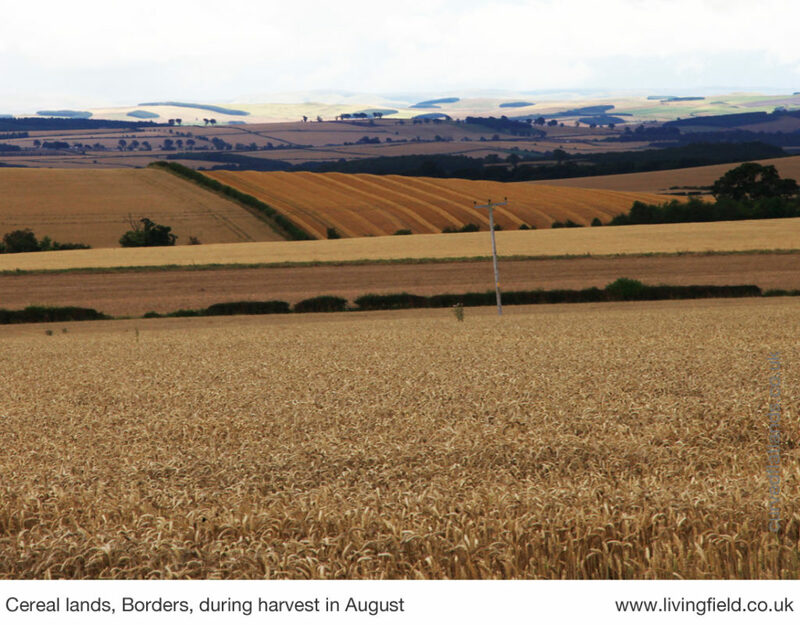 Here we look back at how things evolved from field studies in barley on the Institute’s farms to growing our own range of cereals and finally using bere barley and other flours to make bannocks, bread and biscuits. The sequence is shown here for bere barley. Seeds are sown, crops are grown. Bere plants support reproductive heads or ears holding grain. Plants are harvested and the grains removed and cleaned. They are ground into meal or flour, then used alone or mixed with other flours to make bread, bannocks and biscuits. This sequence has sustained people for thousands of years. 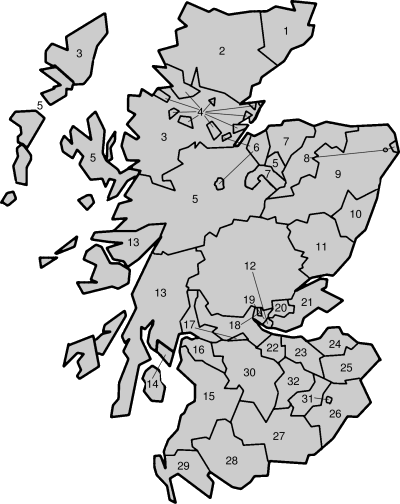 Today the grain we eat in Scotland, except for oats, is not grown here – the main cereal products from local fields are alcohol and animal feed. But whatever the future of agricultural produce, the grain-based cycle will remain essential to settled existence. 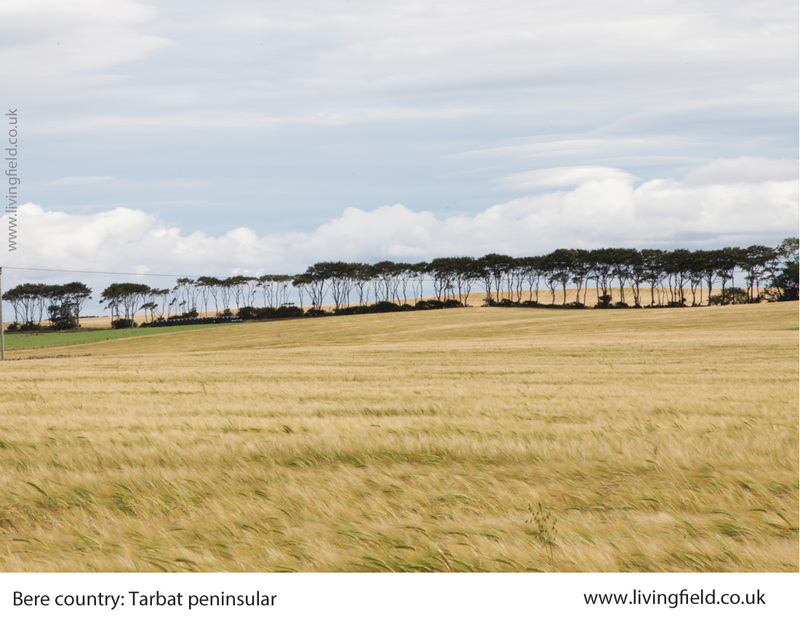 In this retrospective, we describe the Living Field’s shared experience of ‘seed to plate’ over the last 10 years. 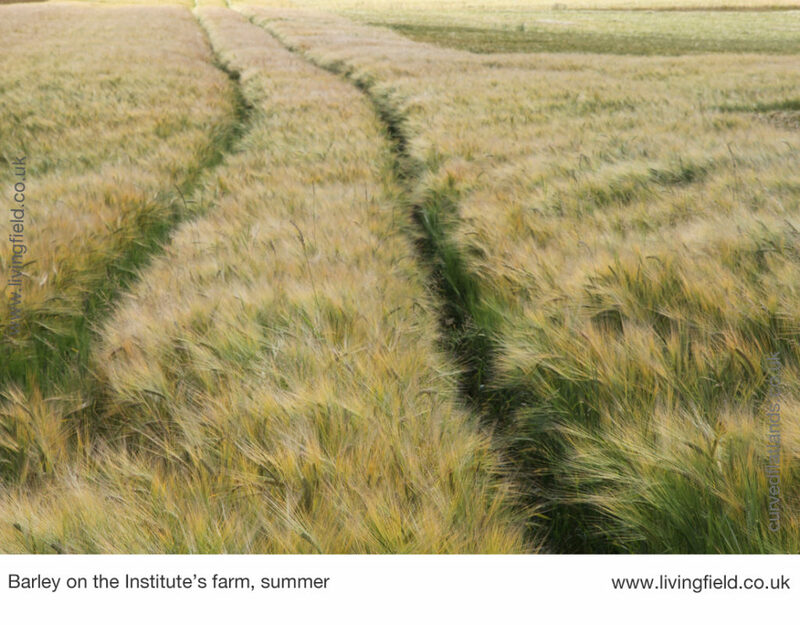 We began by introducing visitors to the James Hutton Institute’s fields where barley is grown both for experiments and for commercial grain sales. 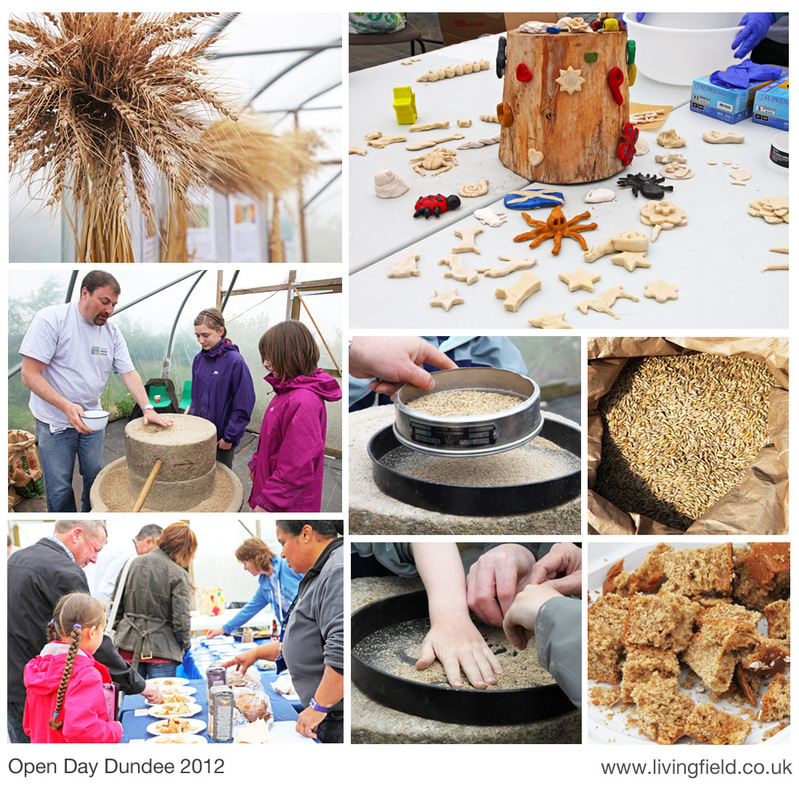 From 2007, the Living Field has been using the farm’s barley to give school parties a first taste of life in the crop. 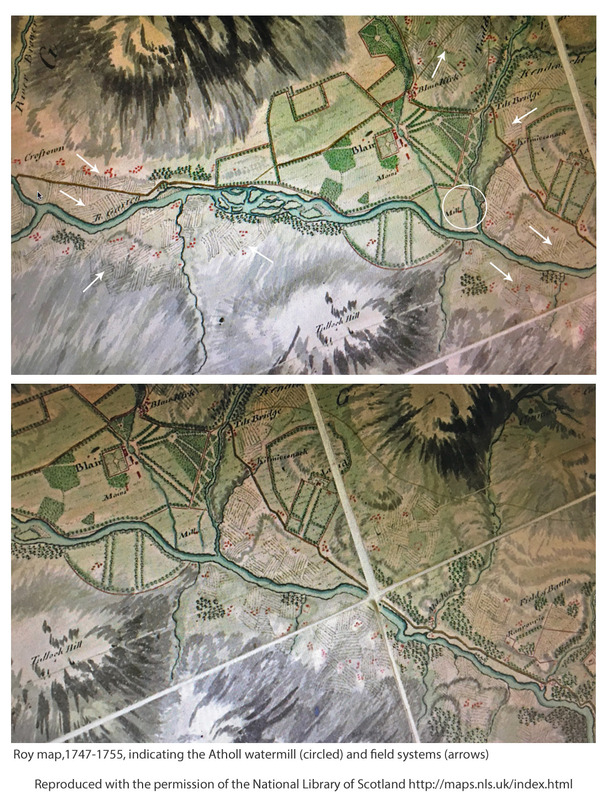 The larger image above looks down from a barley field at Balruddery farm to the Tay estuary. 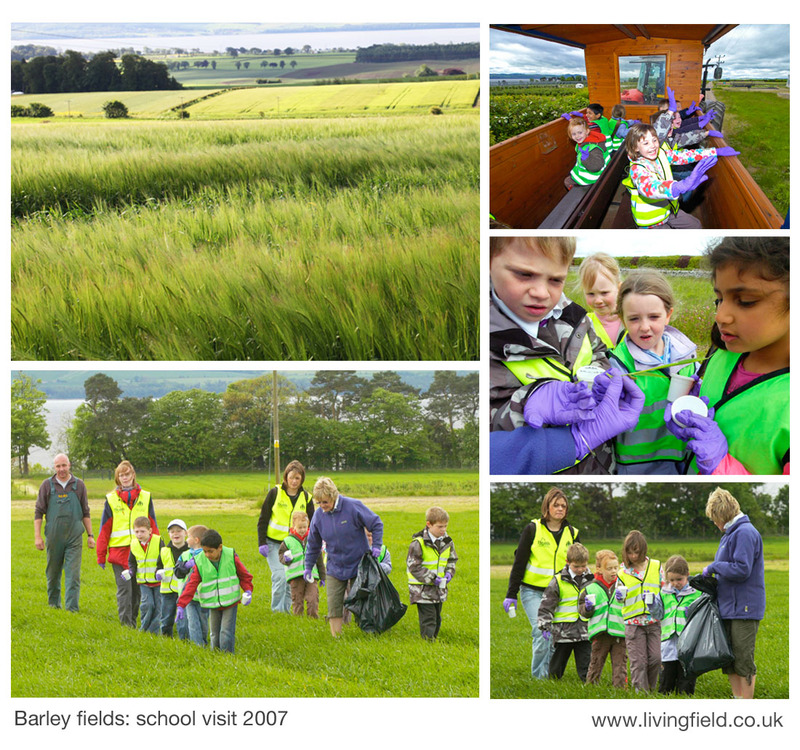 The school children in the pictures were visiting fields of young barley at Mylnefield farm just above the Tay. This was in May 2007. They walked along the ‘tram lines’ looking at plants and finding ‘minibeasts’ – the first time many of them had been in a crop. They were fascinated with small creatures found crawling on the plants or walking over the soil . 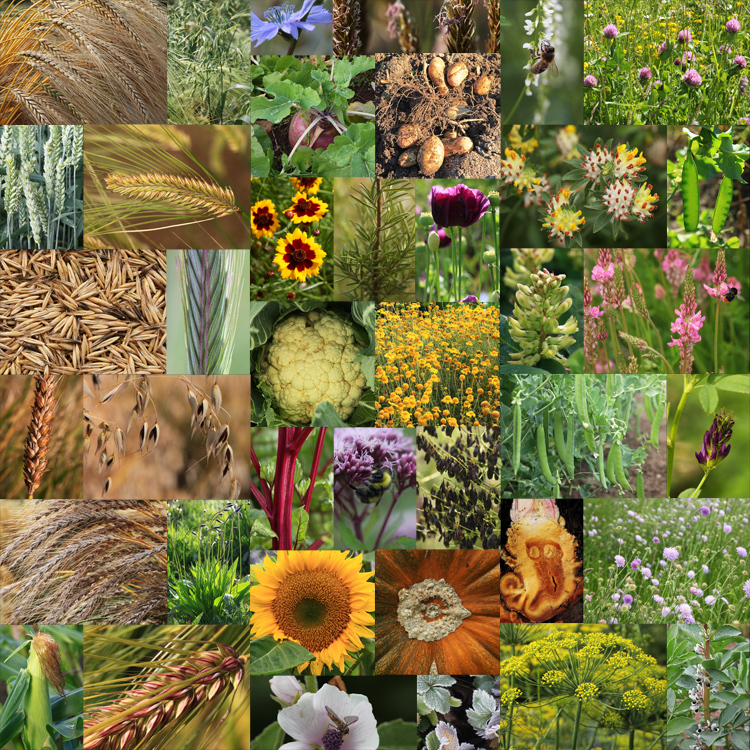 The public interest in crops and their ecology in those early visits encouraged us to explore a much wider range of cereal plants than presently grown in commercial agriculture. So began a small collection of grain crops which were sown, tended and harvested each year in the Living Field Garden . 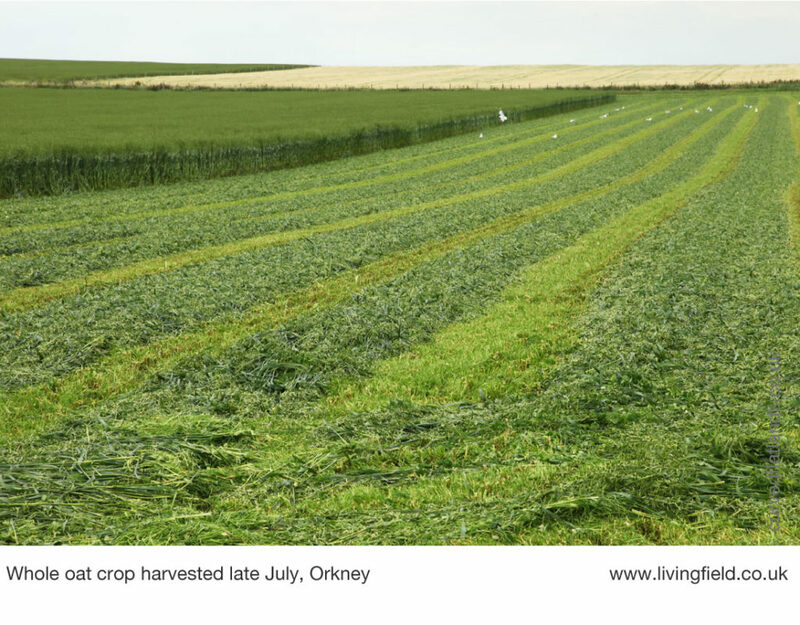 We began in 2010 by growing bere barley from Orkney, black oat, emmer and spelt wheat, alongside modern varieties of barley, oats and bread wheat. Rye and a landrace of bread wheat from the western isles were added later, then several other barley landraces and old varieties . The collection of photographs above shows a general view of the garden. including a tall cereal plot (middle right), then c’wise from upper right – a barley landrace from Ireland, rye, black oat, emmer wheat, young spelt ear, spratt archer barley and a bread wheat landrace. 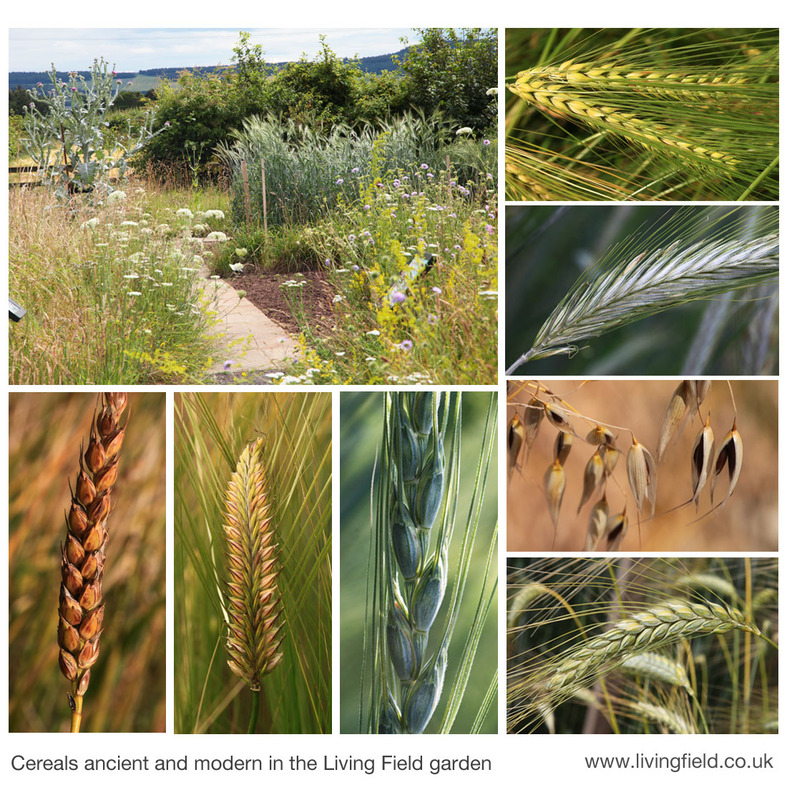 By 2011, the Living Field had combined its practical experience on the farm with the collection of ancient and modern grains in the Garden. Gladys Wright and Jackie Thompson had perfected the way to grow all these different species. We now needed a means to demonstrate processing the grain and making food from it. The harvest from the small plots in the garden was too little to make flour enough for open days, road shows and exhibitions. 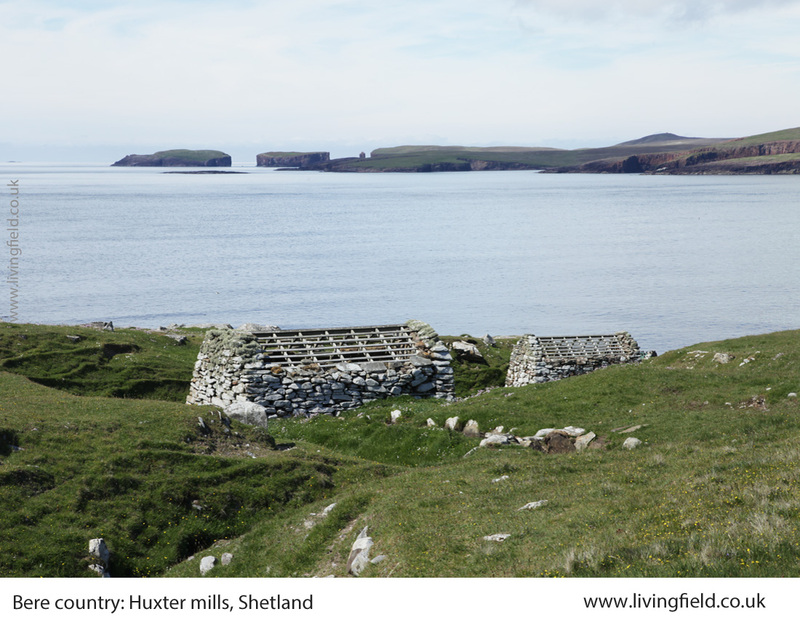 Additional grain and flour (or meal) was begged or bought from a range of sources, notably Barony Mills in Orkney and ‘Quaker Oats’ in Fife. 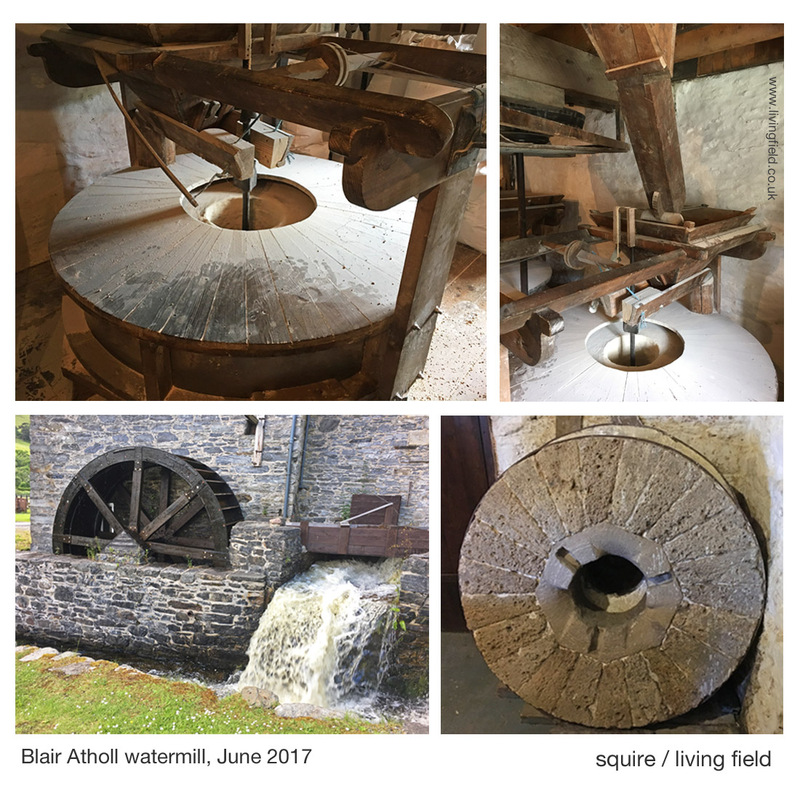 The Living Field then bought its own rotary quern for grinding the grain into meal and chaff, which is the name given to the other bits we don’t usually eat, mostly the protective sheathing around the grain and the awns. Now to make a loaf! Fortunately one of the team, Gillian Banks, was already an experienced bread-maker and after some experimentation turned out tasty loaves made from various mixtures including bere and modern barley, oats, emmer, spelt, wheat, rye …. and more ! The whole chain from sowing seed in the ground to making food could now be demonstrated from first-hand experience. We did this at various open events beginning 2012. The panel above shows (bottom left, clockwise) – visitors experiencing a range of ancient grains and flours, demonstrating the rotary quern, a sheaf of spelt, making things from sourdough, and a four-panel set showing oat grain in a bag, sieving and sorting meal from chaff and finally bread. The highlights of our outreach over the years has been LEAF Open Farm Sunday. The Institute is a LEAF innovation Centre , so on the first Sunday in June, the farm and science come together to host the event. One of the main attractions is the hub of activity around the Living Field garden, cabins and tunnel. Typically 1000-2000 people visit the hub during the day. We’re mobbed ….. thanks to all! The essential structure of a successful open day is, firstly, to provide plenty of things to do for young children, to keep them occupied and allow time for older children and grown-ups to talk about what’s on view; and, second, hands-on activity with natural products, things such as living plants, and grain and flour that can be touched, felt and smelled . Group activities are usually located in the garden’s polytunnel, just in case of rain. The panel above shows (lower left c’wise) examples of grain and flour, a ‘tasting’, making things with grain and other natural materials, an activity table for children and their grown-ups, and bags of grain from the garden with young scientist sitting on the rotary quern fascinated by oat grains. The thread linking exhibits through the years has been bere barley – Scotland’s barley landrace, an attractive plant, easy to grow. Bere as a crop declined in the late 1800s and is now restricted to a few fields in the far north. Like most of the world’s landraces, bere faded in competition with modern crop varieties and production methods. Yet it remains a favourite here. Its story continues . 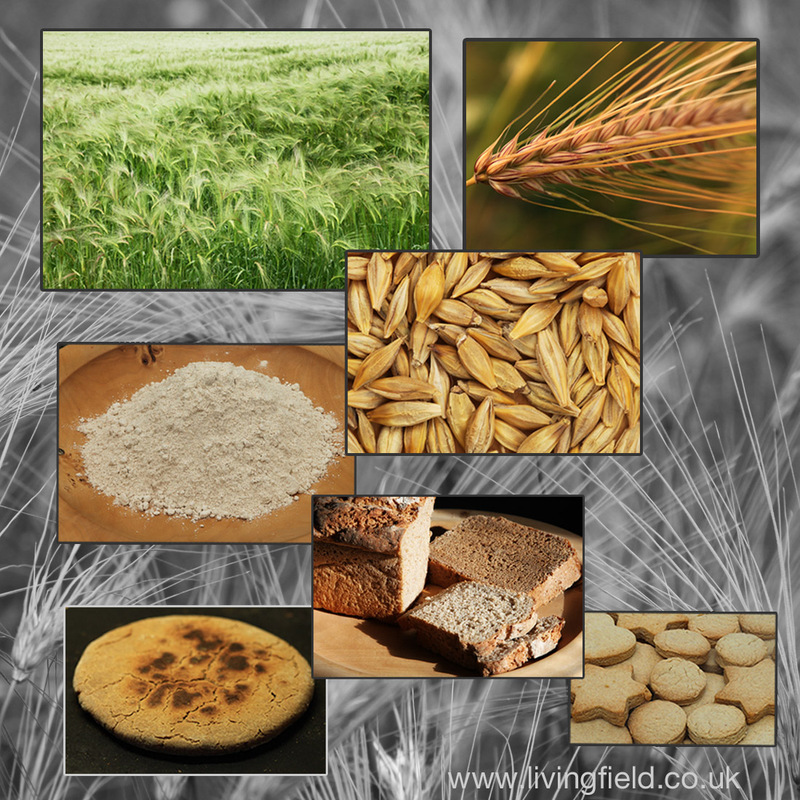 Bere and other barleys were traditionally used to make a flatbead or bannock, either on its own or mixed with oatmeal or peasmeal, but bere meal has many uses when mixed with other flours. The Living Field has friends and correspondents like Grannie Kate who regularly experiment with different uses of ancient and modern grains. 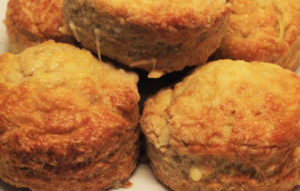 Scones, shortbread, batter, porridge, soups can all include bere as a unique constituent. One of the team regularly adds a a spoon or two of bere meal to their morning’s rolled-oat porridge. The images above show (top left, c’wise) bere and oat bannocks, a bag of bear meal in Grannie Kate’s kitchen, bere fruit scones and bere shortbread . Following the Living Field’s appearance at a ‘biodiversity day’ run by the Dundee Science Centre in January 2016, we were invited to join the exhibition trail organised in 2016 by the Centre as part of The Crunch . By this time, we could take take the whole process on the road – seed-plant-grain-flour-food. Gill Banks and Linda Nell, with Lauren Banks and Geoff Squire, ran the grain to plate events at The Crunch venues. One was in a darkened auditorium at the Dundee Science Centre, another at a local community Centre. The Science Centre suggested we bring some bread made in the usual way from cereal grain and some made from insects. Gill bought various whole insects and flours and made some insect loaves that several of us had a pre-taste of and concluded they tasted just like nice wholesome loaves. Anyway, the insects went down a treat at the events and started many a conversation of what we eat and what it costs – insects gram for gram need much less energy and cause much less pollution than most other forms of animal rearing. The panel above shows scenes from the (top right) the January event) and bottom right (The Crunch) both at the Science Centre, then (top left, down) sheaves of spelt and black oat, globs of gluten extracted from wheat by Gill, mixed-flour bread with dried crickets laid on, and (at the bottom) dried insects for cooking or eating and (centre) barley grain. Through working with artists, the team were able to see the plants they had grown become part of artwork. Jean Duncan for example was able to place grain not just as a food but as essential to the development of farming and human society since the last ice. 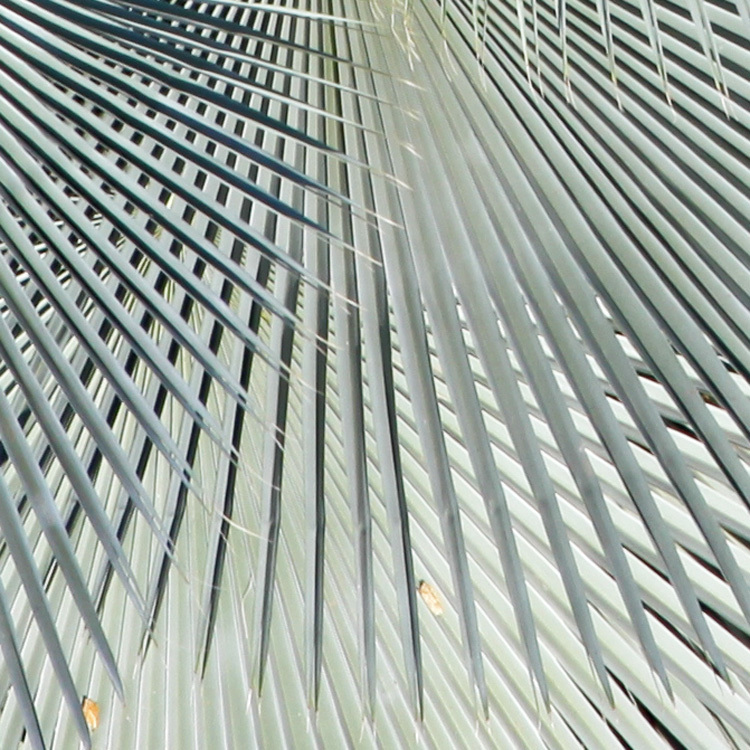 In her work, grains and plants appear close to circles, barrows, landforms and field systems. Some extracts from Jean’s creations are shown in the panel above. Various ears, spikelets and grains appear commonly alongside mounds and barrows (example right). 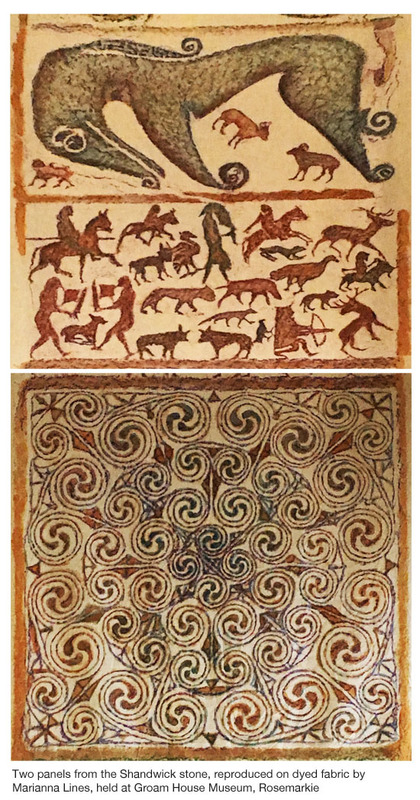 At top left, ancient cereal plants are stylised as fans, drawn near the centre of a circular design, used to create a revolving backdrop for an opera. At bottom left, a section of her ‘teaching wheel’ shows a range of cereal species grown in the region since the neolithic . At Open Days, children like drawing things, messing with paint and pencil: better then just looking, it helps to give them a lasting memory of what they saw and touched. Nearing the end of 2018 and the project will continue its work on bere and other grains, ancient and modern. 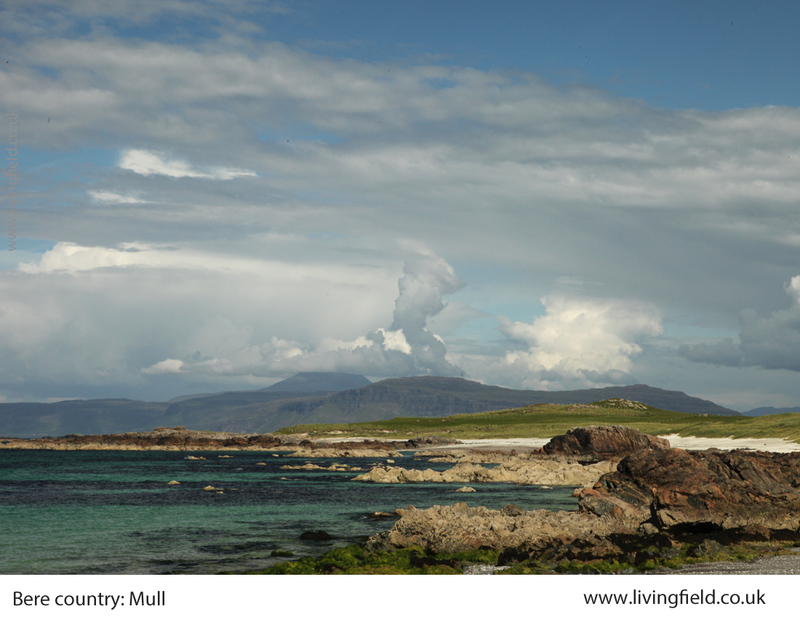 The Living Field is connecting to the swell of interest in local food and recipes. Few others can demonstrate the whole chain – not just grain to plate – but from sowing the seed to eating the food and, crucially, saving some grain for the next year’s crop. 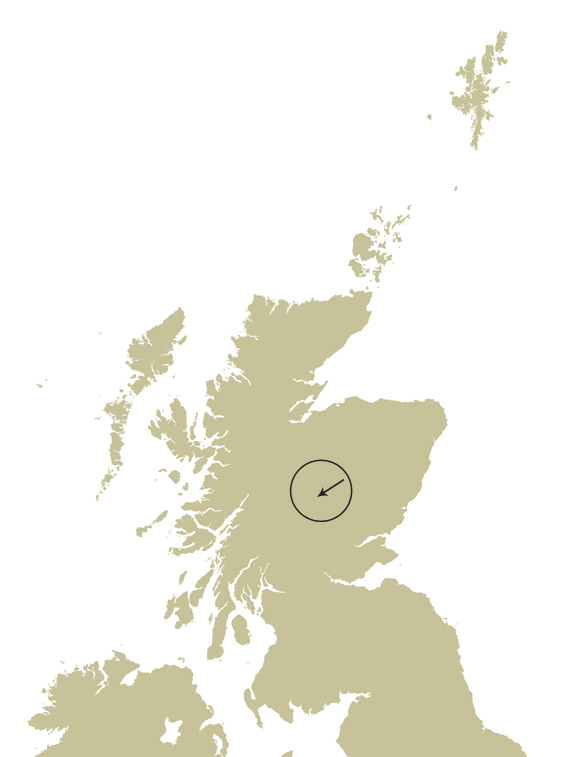 The James Hutton Institute has recently been awarded funds for an International Barley Hub. Let’s see what the 2019 season brings! …… warm bere and crickets? At one time and even now in many places, a bag of flour can have resident insects in the form of weevils. They live and reproduce in it, eat it and recyle it in one form or another (probably best not thought about). They add a little crunchy something to a baked loaf . That’s insect bread ‘by accident’. 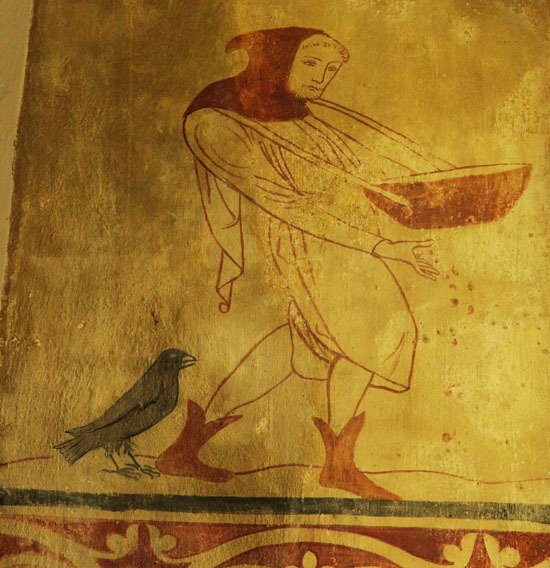 For several years, and as shown above, Gill and Co have been experimenting with bread made from insect flour mixed with grain flour. The insects tried so far are mainly crickets, raised especially for the purpose (though not by us). Insects as alternatives to fish and meat in European diets is a hot topic now . Geoff Squire and and Gladys Wright developed the ideas around a seed to plate theme not long after the Living Field garden began in 2004. The Hutton farm staff have been partners in the Living Field since its making in 2004. They manage the crops, drive the tractors and explain what’s going on to visitors. 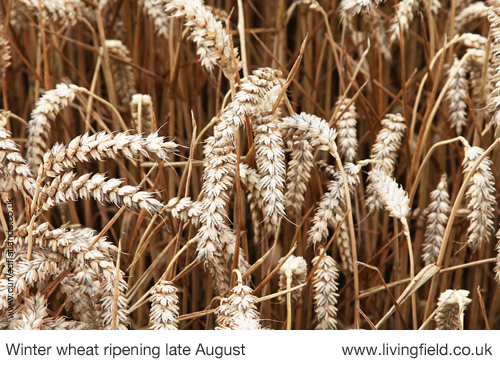 Gladys Wright and Jackie Thompson grow the Living Field cereals from seed each season. They have been helped by several other people in earlier years, especially Linda Ford. Thanks to Orkney College and SASA Edinburgh for giving the original seed. The Institute’s barley collection was the source of several landraces and varieties grown in 2015: see Barley landraces and old varieties. Gillian Banks experiments with bread making and has regularly baked a range of ancient grain loaves and biscuits for open days and road-shows: see Bere and cricket. 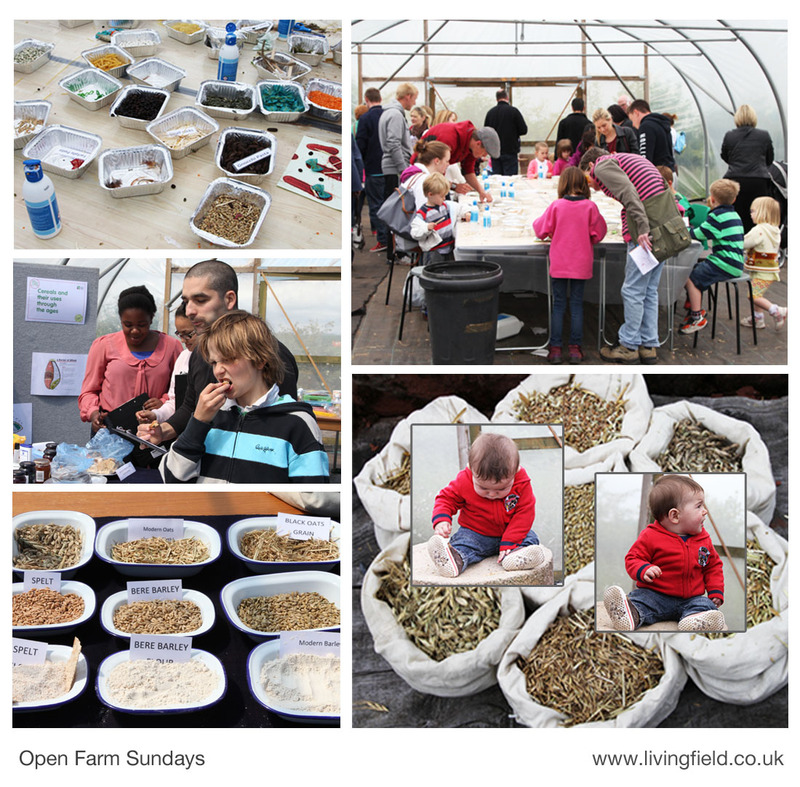 Open Farm Sundays have been well supported by Hutton staff – Gladys Wright and Jackie Thompson prepare and run the Living Field ‘space’; other regular contributors to the ancient and modern cereals theme include Gill Banks, Lauren Banks, Linda Nell, Linda Ford, Mark Young and Geoff Squire. Students and family have helped time and again on the stalls and exhibits. For more on LEAF Linking Environment and Farming, see LEAF innovation Centre. 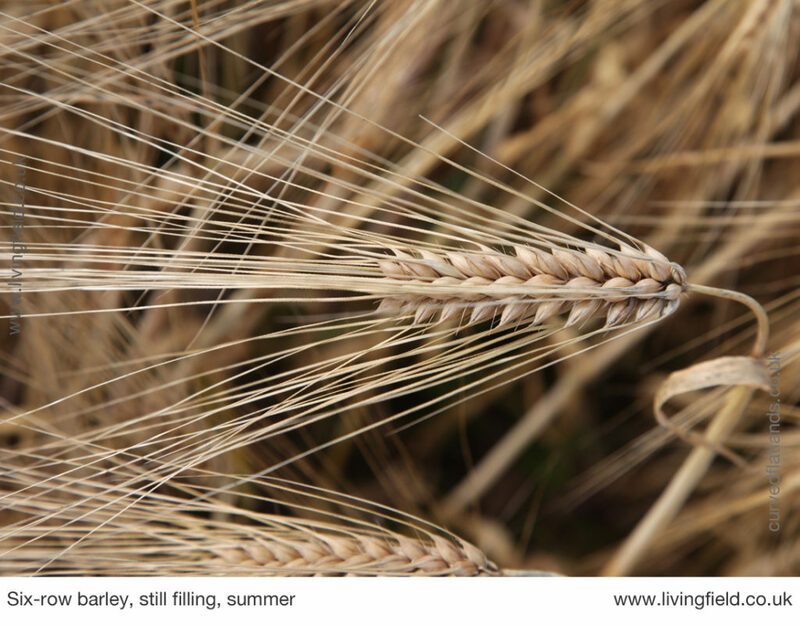 Bere barley and bere meal feature regularly on the Living Field web site, for example see the Bere line – rhymes with hairline, Bere country, and Peasemeal, oatmeal and beremeal. 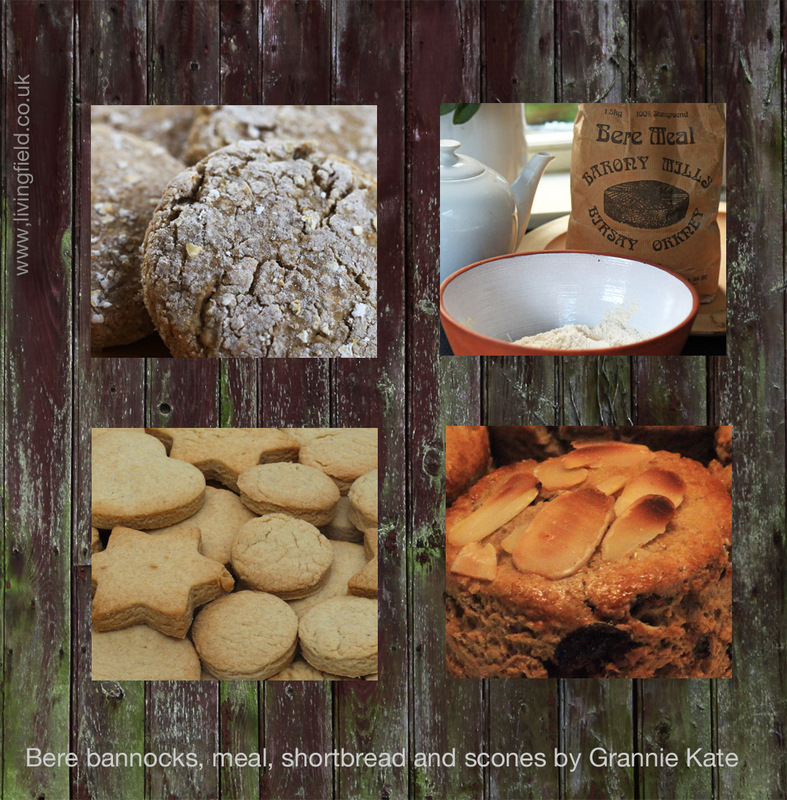 The Living Field’s correspondent Grannie Kate’s offerings mix bere with other flours, see Bere shortbread, Bere scones, Bere bannocks and Seeded oatcakes with beremeal. Barony Mills in Orkney also has a book of recipes. 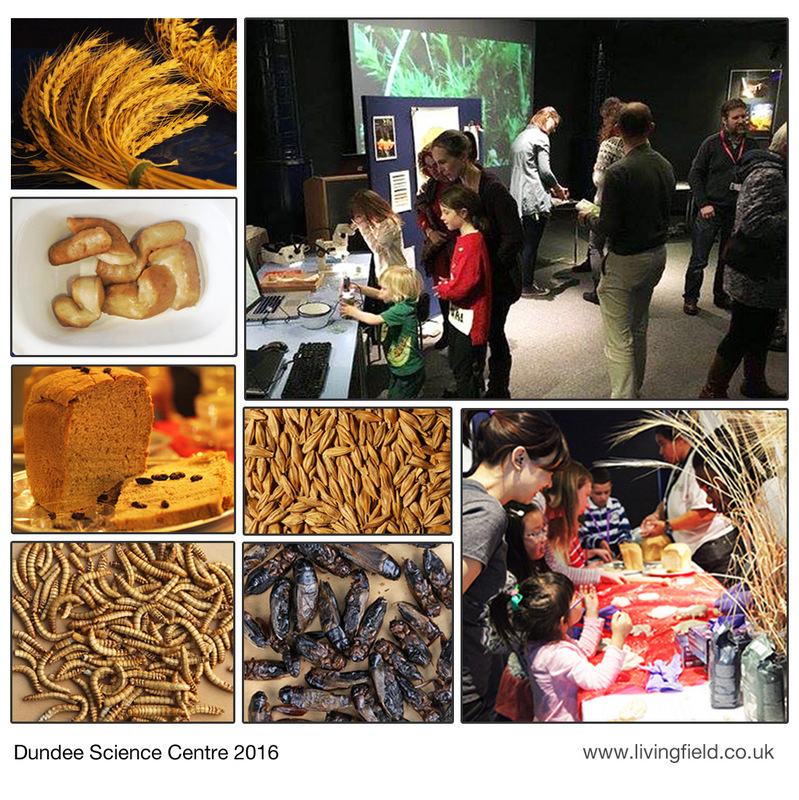 The Crunch was a UK-wide series of events held in 2016, coordinated locally by Dundee Science Centre: Gill and Lauren Banks, Linda Nell and Geoff Squire, among others, offered a range of exhibits on themes of grains and bread: see Bere and cricket, The Crunch at Dundee Science Centre. Thanks to DSC for inviting us to take part. Jean Duncan is an artist who has worked with the Living Field for many years. 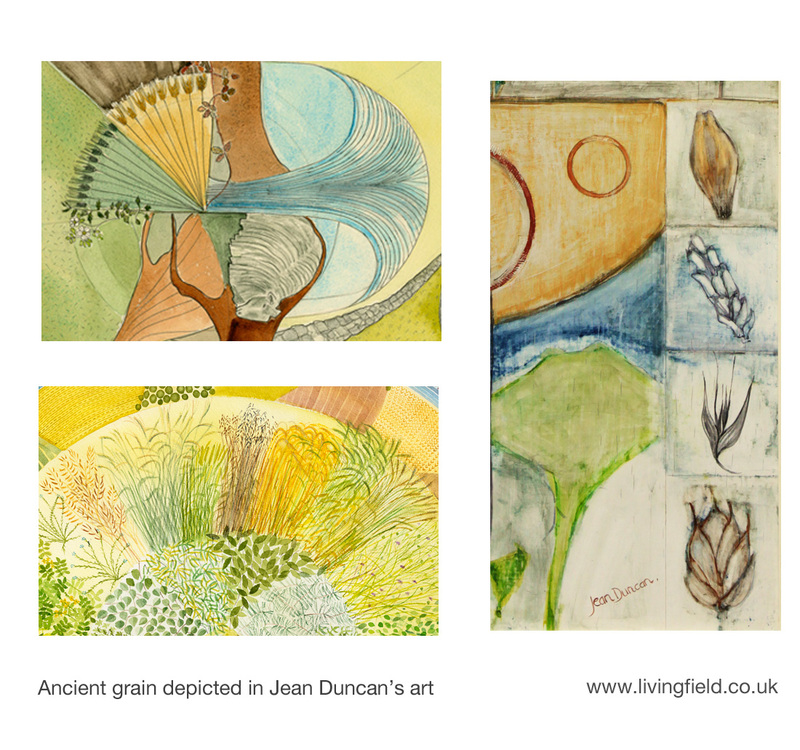 For examples of her work and links to her wider presence from the neolithic onwards, see Jean Duncan artist. 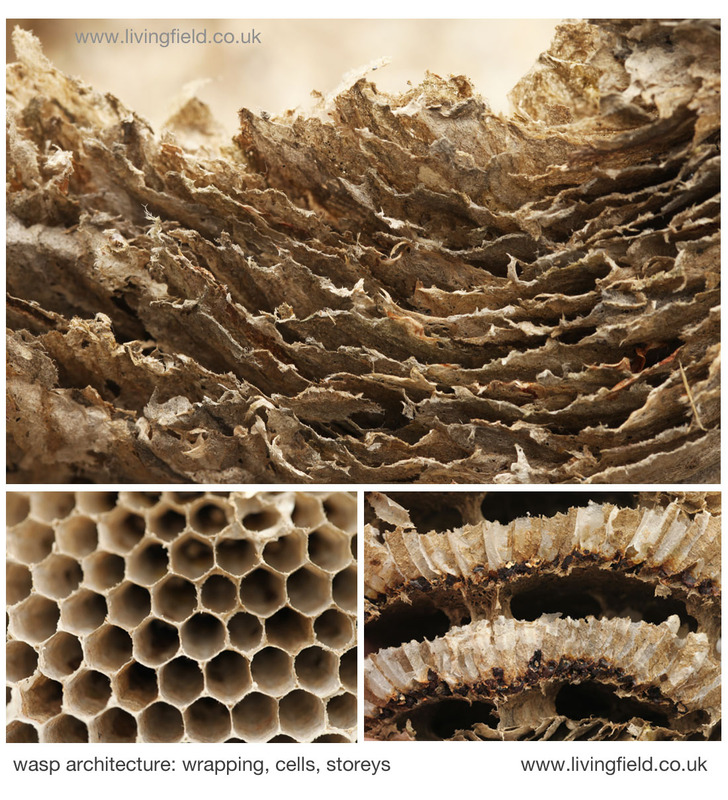 Crunchy bread made by Gill Banks from insect flour: photographs and details at Bere and cricket. Later, Gill, Geoff and Linda F found when investigating an infestation of weevils in grain, that insects in bread, whether by design or accident, bring a high-nitrogen (high protein) addition, insects being about 10% N by weight – little nuggets of protein in your low-N loaf! Maize, along with rice and wheat, and to a lesser degree barley, provides most of the cereal or corn harvest for the world’s civilisations. Maize was domesticated in the Americas and did not arrive here until recent centuries, when ships and navigation were advanced enough to sail across an ocean. Maize is a warm-climate crop  but consists of many varieties, some of which can be grown here in summer, where it’s product is known as corn-on-the-cob or sweet corn. It is also grown in stock farming as an animal feed, but mainly in the south of the UK. Yet maize has many other uses. 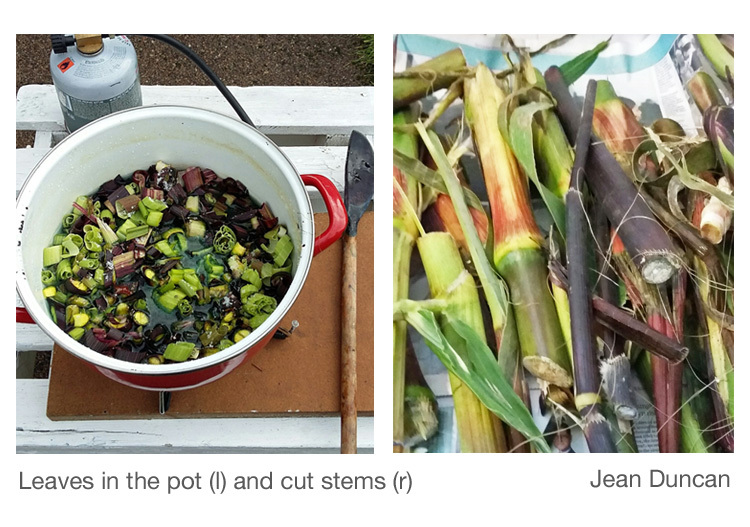 Here we look at two of them, both starting with the husk surrounding and protecting the cob – Jean Duncan’s exploration of paper-making using husks from maize grown in the Living Field garden, and the traditional use of maize husk as wrapping for Burmese cheroots. For making plant paper, Jean tried various parts of the maize plants including the leaves, the thick stems and also the papery coverings of the flowering and fruiting head, known as the husk, which she said made the best paper . The images above are of a print on maize husk paper of an etching of a maize root cut in cross section and magnified so that the internal structure can be seen. In the print on the left hand side of the images, the original root cross section is about 1 mm wide, the image itself is 22 by 22 cm and the paper 40 by 49 cm. To the right are close-ups of part of the print and of the paper, showing the visible fibres from the original husks, now converted into paper. The paper in this case became a visible part of the finished art. Sources below give links to Jean’s description of making the paper and an exhibition in which images of roots were printed on various plant-based papers . Once it was brought across from the Americas, maize travelled quickly in the 1600 and 1700s and became a favoured cereal through Africa and among the warmer parts of Europe. 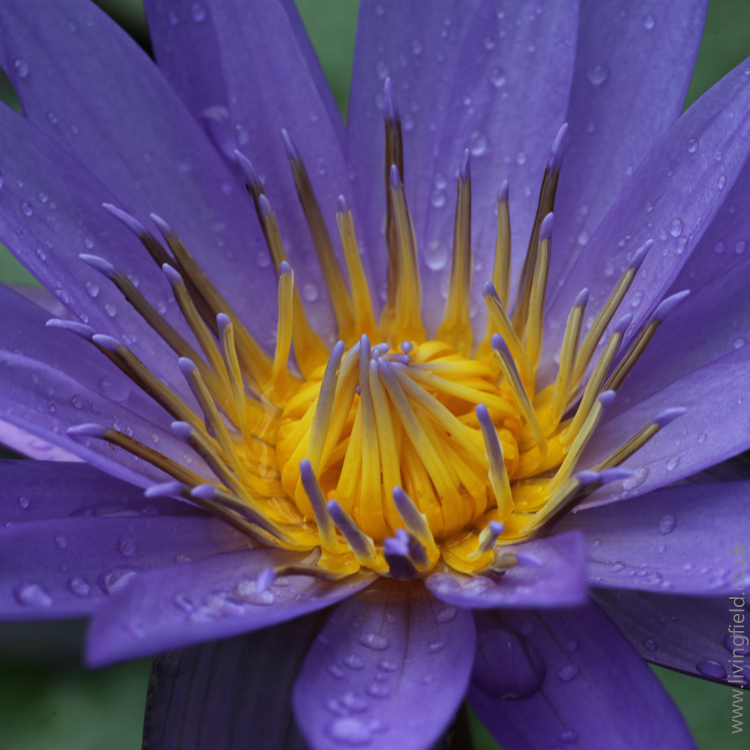 It established also in Asia, but usually as a secondary crop behind rice. Its parts were used not only for food for humans and animals. There is a history of usage as a medicinal, as a substate for alcohol (e.g. chibuku in Africa) and curiously, as a wrapping for cheroots. The long cigar shaped structures smoked in Burma (now Myanmar) and known as cheroots are usually filled with a range of herby and woody plant material, not always including tobacco. 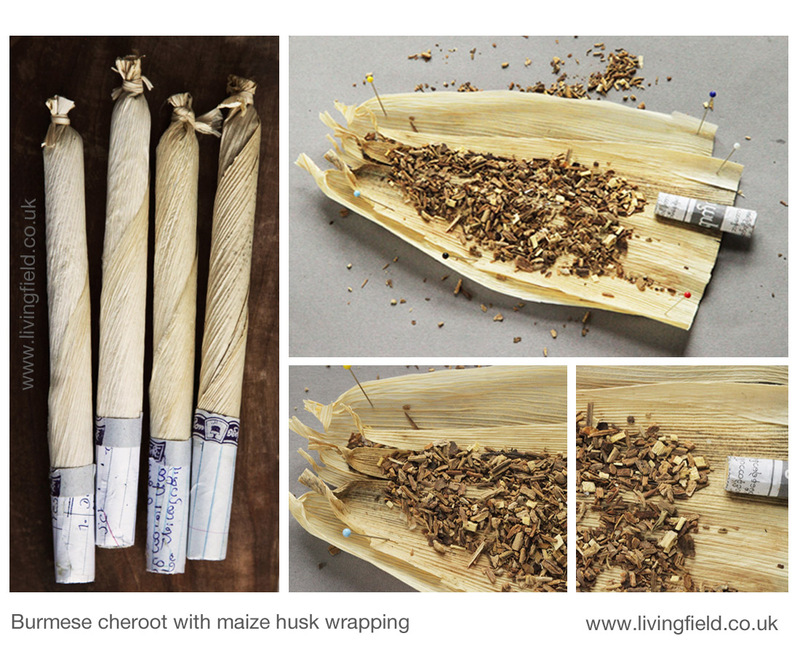 The wrapping can come from a range of plants, but the cigars below were wrapped in maize cob husks . Several husk-leaves were used to wrap each cheroot. 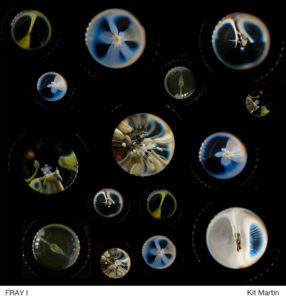 The contents were, as said above, derived from a range of plant material, most pieces being 2-4 mm long. Each cheroot had a filter, consisting of tight rolls of leaf or husk. They were on sale locally along the Irrawaddy River in Burma, now Myanmar . In his compendium of useful plants, Burkhill  notes that an industry arose in north Burma at some time in the last few hundred years, based on the use of a type of maize, characterised by a waxy endosperm (the store in the seed), which also had a ‘peculiar suitability of the sheath for cheroots.’ He also refers to the possibility that certain impoverished areas were afflicted by the vitamin deficiency pellagra through reliance on maize, as in parts of the USA . 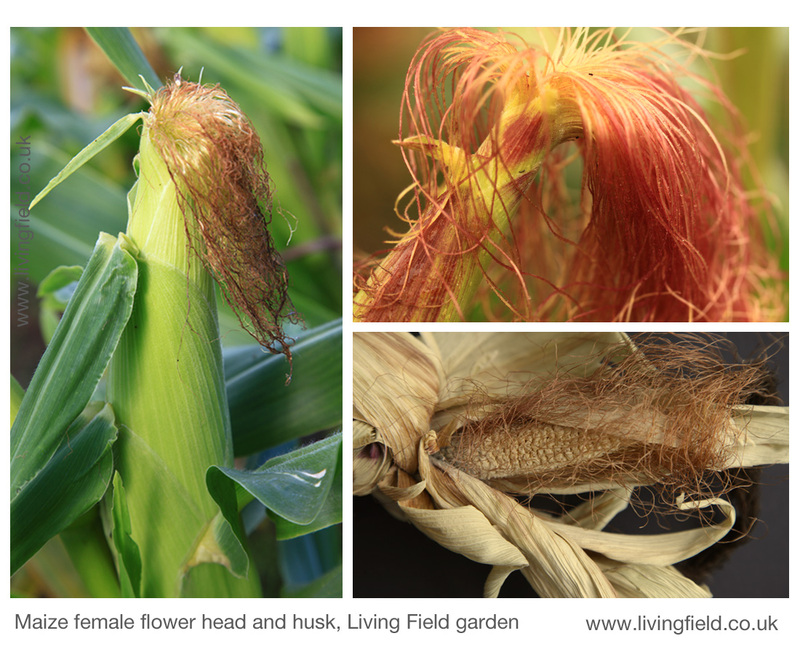 Maize is unusual among the cereal or corn plants in having separate male and female flower heads, each on compact ‘branches’ held on different parts of the same plant. The male flowers are usually held at the top of the plant and the female lower down. Female branches are shown in the images below, taken in the Living Field garden. The female flowering head remains mostly hidden within a sheath of leafy material (above left) that later forms the husk. The grain sites are arranged around the central ‘stem’ hidden by the sheath. The stem and grains together will later form what we know as the corn cob. Each grain site puts out a long thread, many of which together emerge from the sheath in an irregular bunch, often named a silk, the female part of the reproductive process in this species (seen reddish, above left and top right). The function of each female thread (comprising a stigma and style) is to receive pollen from male flowers and to provide a channel for the pollen tube, that emerges from a pollen grain, to grow into the sheath to a grain site. When pollinated, the grain sites fill to give the familiar, yellow kernel which remains protected by the sheath. Sometimes the season in the Garden is too short for late flowering maize heads and they do not grow into a finished, filled cob. One of these late heads was prized apart to show an undeveloped cob (lower right in the images above) and the surrounding sheath that had turned to parchment in feel and colour. The female threads, now fibrous and dead, can just about be seen issuing from each grain site. The paper shown in the images at the top of the page was made from husks like these. Finally, here is an image of maize intercropped with groundnut growing by the Irrawaddy river . The male branches can be seen at the top of some of the plants. Female flowering heads are circled. The botanical name for maize is Zea mays. The genus Zea is of the grass family and has only this species. It was domesticated and developed many thousands of years ago in Central and South America. It was first brought across the Atlantic Ocean in the late 1400s, then spread rapidly east. 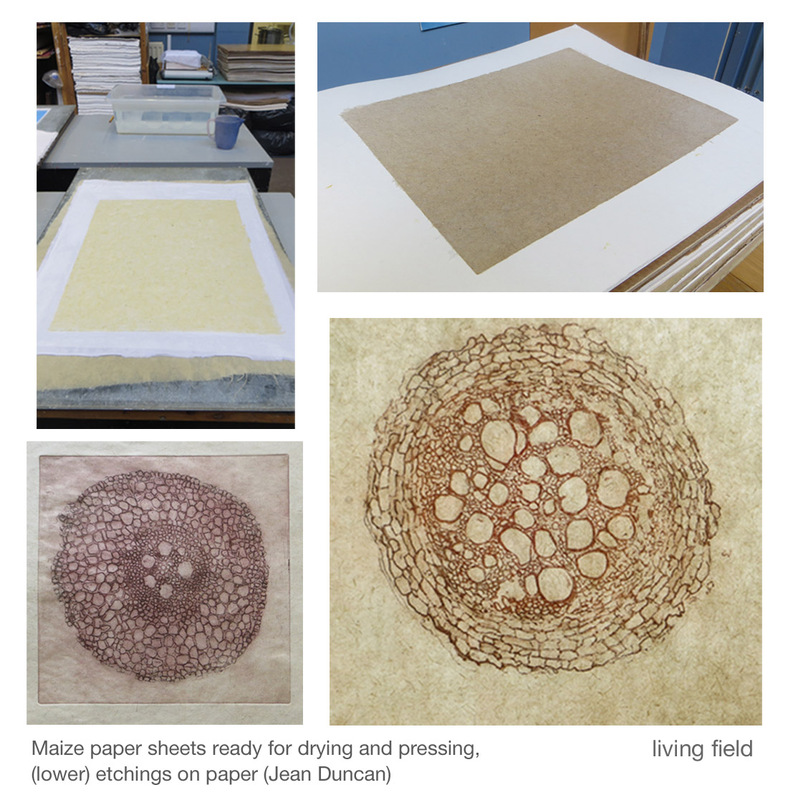 The article Maize paper by Jean Duncan describes how to make paper from plants in the garden. The exhibition The Beauty of Roots shows prints and etchings made on maize and other plant papers displayed at the University of Dundee in 2017. Details of the spread and growing of maize in Asia are given in the major compendium of useful south-east Asian plants by Burkill, published in 1966, but clearly the result of many decades of investigation and cataloguing. He lists the use of maize husks for cheroot wrappings and of maize leaf and stem for paper. Burkill IH. 1966. Dictionary of the Economic Products of the Malay Peninsular. Two volumes, 2444 pages. Published on behalf of the Governments of Malaysia and Singapore by the Ministry of Agriculture and Co-operatives, Kuala Lumpur, Malaysia. The entry on maize is in Vol II at pages 2327-2334. The writer refers to the following article for confirmation of the use of ‘waxy’ maize varieties as cheroot wrapping in Burma: Collins GN.1920. Waxy maize from upper Burma. Science 52, 48-51. doi 10.1126/science.52.1333.48. The cheroots shown in the images were bought at a village store in 2014 on the banks of the Irrawaddy. Further description of the region is given at Mixed cropping in Burma on the curvedflatlands web site in an article by G R Squire. Disclaimer – no cheroots were smoked in the research for this article! The Living Field we site has the following articles on maize and pellagra: Cornbread, peas and black molasses and Peanuts to pellagra. “Fed up of ‘days old’ fish from the supermarket? Try stopping a local fish van to see the beautiful produce on sale! This was what I did last Friday morning at 9.50 a.m. precisely and bought some haddock (landed that morning) from a mobile fish merchant from Anstruther. Home made fish and chips then, for tea, using my mother’s recipe for coating the fish before frying in oil. 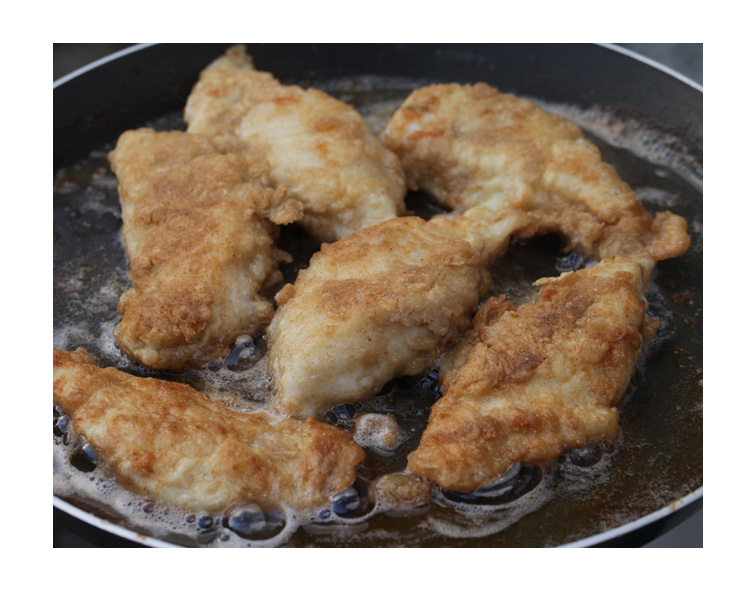 Haddock (and other white fish) tend to break up in the frying pan if they are fried without coating them first. Fresh haddock from the sea and …… earthy bere meal from Barony Mills! Place a large tablespoon of bere barley on a plate and then (if preferred) mix with white flour, e.g. another large tablespoon or less depending on your taste. Grind sea salt and black pepper into the flour to season it. Crack a fresh free range egg into a small jug and whisk it until the yolk is well mixed with the white. Wash the fish ( this is important especially if the fish is not as fresh as you would wish and actually smells; remember, fresh fish does NOT smell!). Cut the fish in half lengthways to give 2 portions. Then cut again diagonally across the portion to give two or three smaller pieces or goujons. You now have about 6 goujons of fresh haddock. Dip each goujon into the egg, shake off the excess egg wash then place onto your flour, rolling it around until it is covered. Repeat for all the haddock pieces. Add some light cooking oil into a frying pan and heat – to test the temperature is right add a little bit of flour to the oil and it should start to bubble up immediately. Add all your goujons to the oil, fry for about two or three minutes on one side, then two or three minutes on the other on a medium heat. Lift out with a fish slice onto some kitchen towel and blot lightly to remove excess oil. The goujons should be light brown with a thin crispy coating of bere meal on the outside. Serve with fresh garden peas and homemade chips. Add salt and vinegar or wedge of lemon and perhaps some tartare sauce! The bere meal was sourced from Barony Mills in Orkney. 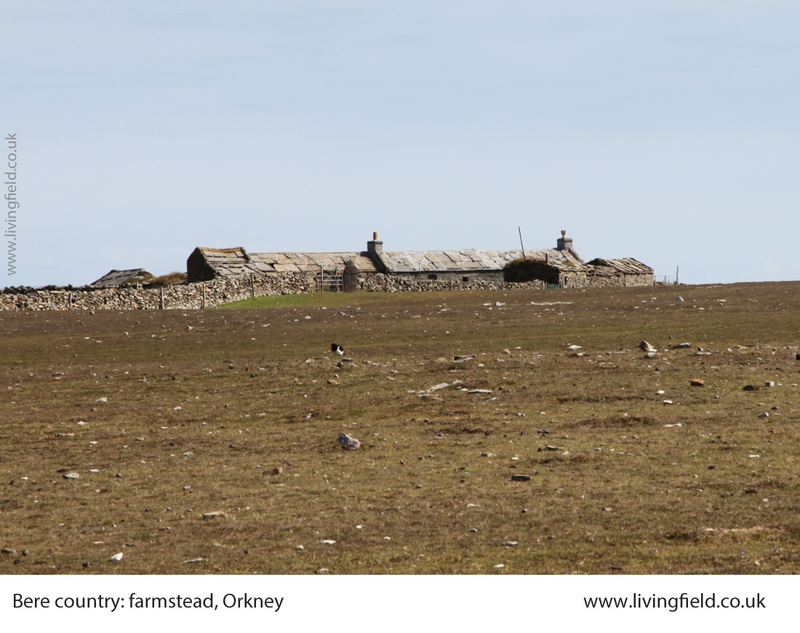 For more on Orkney bere, see: Bere line rhymes with hairline and Landrace 1 Bere. 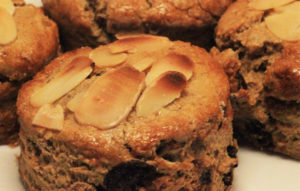 And for other bere recipes on this site – Bere bannocks and Bere shortbread and Seeded oatcakes with bere meal ….. Most of our paper comes from plants, but the process by which leaves and stems are converted to sheets that we can write on or wrap things in is unknown to most of us. 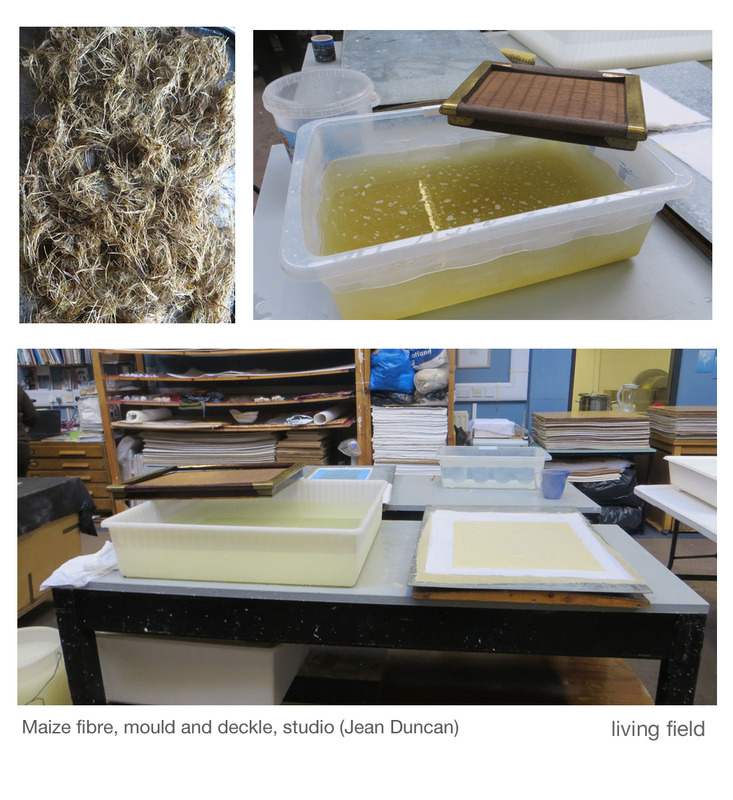 As part of her work with the Living Field, Jean Duncan has been making paper from plants grown in the garden. She started with some maize, which is a tropical and sub-tropical species originally from the Americas. Some types can now grow in our climate, and it was one of these that was grown in the garden for its cobs (corn on the cob). 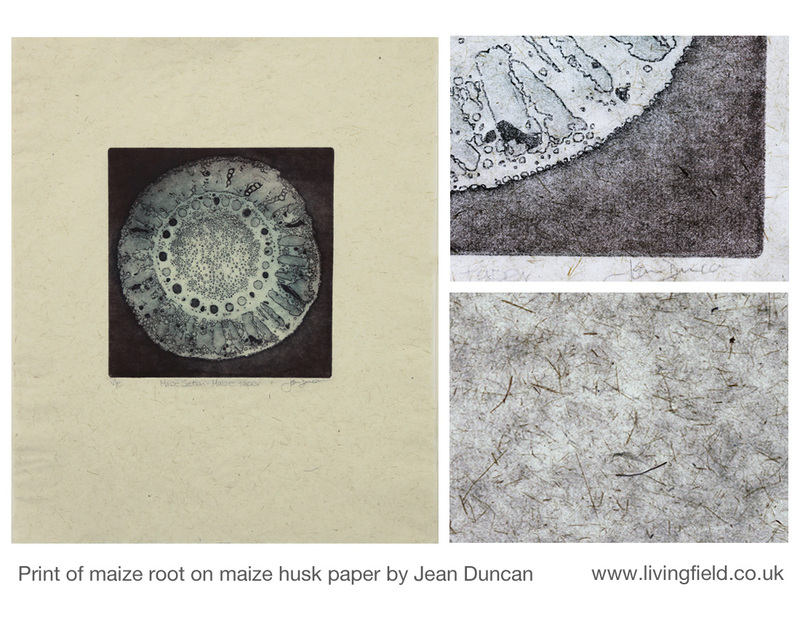 Jean used the maize plants to make the paper. Here is a description of what she did. 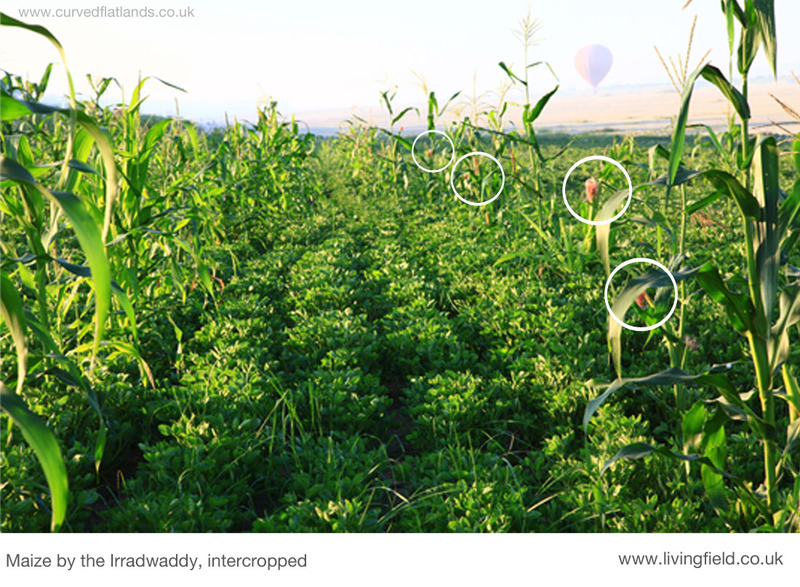 Step 1 is to collect maize leaves and stems when they are in good condition, still green. Step 2 is to cut the leaves and stems into small pieces. Leaf pieces should be about the size of those in the white bowl. The tough stems were cut into larger pieces (right below). Step 3 – put the cut material into an enamel bowl or pot (above left). Add soda ash to the material, 1 teaspoon for a 10 litre pot, and mix. 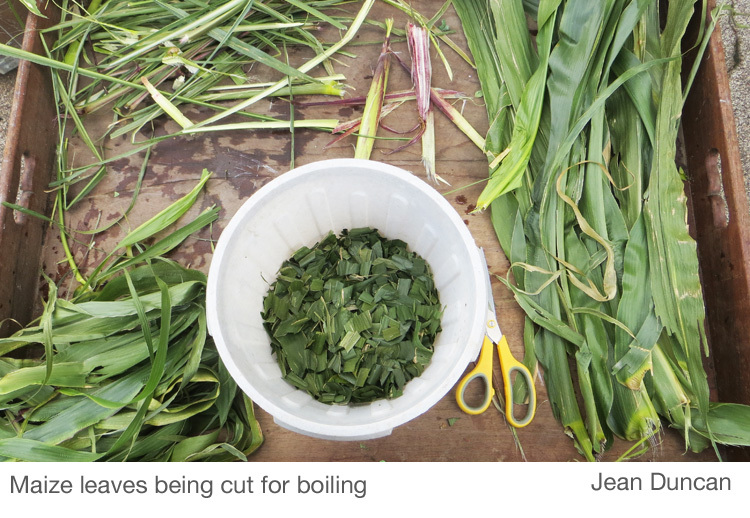 Step 4 – cook the plants for 3 hours, or more if the material is tough. At this point you will need pH indicator strips (litmus paper) to check that the cooking is going according to plan. (Litmus can be bought on-line or at some gardening shops.) The pH of the mixture should be around 8, but if it drops to 7 or 6 then add a little more soda ash. When cooked, the fibre should be soft and easy to tear. Step 5 – rinse the fibre thoroughly in water; when fully rinsed the pH or the water should be neutral (i.e. about 7). Step 6 – the fibre now needs to be beaten to a pulp. The traditional way is to beat it with a mallet for a few hours. (Craft-workers in some countries still use this method). An alternative, if you have electricity, is a kitchen blender working in short bursts so as not to burn out the motor. Jean uses a machine called a Hollander beater. Step 7 – the fibres are now ready to be transformed into sheets of paper. The pulp is suspended in water. A ‘mould and deckle’ is lowered into the water (image above) and brought out slowly with a flat layer of fibre on it, or else the pulp is poured into the mould and deckle until there is a flat layer of the right thickness for the type of pulp (which you work out by trial and error); the water drains out through holes leaving the moist fibre. Step 8 – the moist sheet of fibre is turned onto an absorbent fabric or board or something similar for drying and pressing, a procedure that takes about 3 days (top right in images below). And that’s it – a sheet of paper! Jean’s recent work on an exhibition of etchings using her own-made paper: The Beauty of Roots and Root art.